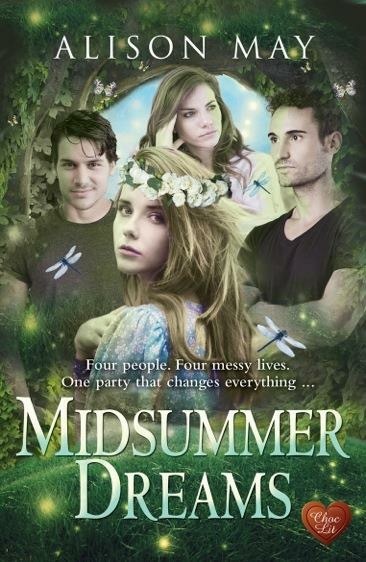 Today is the e-launch day for my friend Alison May’s brand new romantic comedy, Midsummer Dreams. She asked a few of us to post about dreams in celebration and gave us three questions to answer. I had a dream when I was a teenager that I would one day have a book published. I wrote my first novel when I was fourteen and although I haven’t achieved publication yet, I’m working very hard towards it. As a member of the Romantic Novelists’ Association’s scheme for new writers, I get to send off one novel each year for a critique by a published writer. As I type, I am 93% through my final read of this year’s novel and hope to post it off today or tomorrow. An event both exciting and scary – will the reader think it is any good, or is it back to the drawing board? I wonder how many people reading a novel even think about how many hours go into the production of the book they are holding? I’ve been working on my novel “Who is Harry Dixon?” since the beginning of November. Wish me luck with it, as I wish Alison luck with her new release. The nightmare is to put in all of this work and never be published, but then I think I will get to the point where I self publish if that happens. So, I won’t allow my nightmare to happen, or be scared by it. As for most writers, I guess my dream for the future is to write books that people want to read. A best seller would be wonderful, but right now I’d settle for my work in print with good reviews. Join in with discussions on Twitter with the hashtag#MidsummerDreams and on Facebook. Good luck with the book, Alison. The cover is lovely. If you’d like to share your responses to the three questions, please post them below. That writing scheme sounds amazing. I must now search for a SF one. Congrats to your friend!